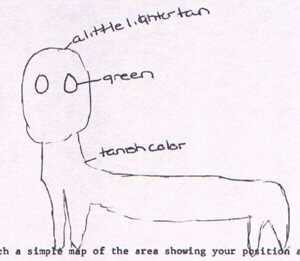 Baxter's drawing of the creature. Note that it is standing on two feet, rather than four. Until my hate-mail inbox clears up, I think I'll stay away from writing about alien abductions and UFOs for a little while. On the other hand, it seems that that's what people want to read: Between my last two articles I've received over 50 e-mails and been listed on Fark.com. But enough bragging (how many of you can say a grammatically-poor essay you wrote while sitting on the john has been read by 25,000 people?) for now. Instead, I'd like to honor the request of layout staffer Pat Xin and look more closely at the tale of the Dover Demon. April 1977: the town of Dover, Massachusetts. Three 17-year-olds driving along a lonely road. 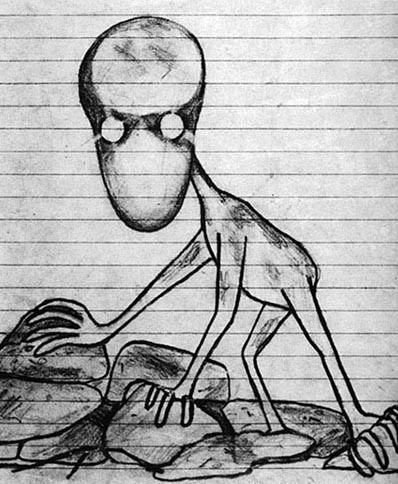 One of them, Bill Bartlett, noticed a creature near a wall of stones. The thing turned and looked into the headlights with large, shiny eyes "glowing brightly like orange marbles." It had a large oval head that was easily as large as its body atop a spindly neck. The body was, like mine, quite lanky, and it had large hands and feet. Also similar to myself, the creature was hairless and appeared to have rough, pale skin similar to the texture of sandpaper. It was only in view for a few seconds, and while no one else in the car saw the little beastie, they all agreed that Bill was "genuinely distraught." Left: Bartlett's original sketch. Right: a later image with added color. When he returned home that night he drew a picture of the monster, later to be dubbed the Dover Demon by a local newspaper, when his father noticed that he was rather upset. Over the course of the night two more sightings occurred before the thing ambled back into the mystery from whence it came. 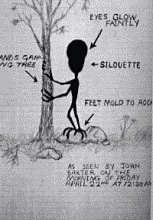 A 15-year-old named John Baxter sighted the Dover Demon while walking home from his girlfriend's house, at first mistaking it for a very short friend of his (accounts state that the creature was less than 4 feet tall). Baxter, being braver than I, got a good look at it (I would have run screaming into the night) for a few minutes. It had long toes and fingers that it wrapped around a tree trunk and rocks as it stood, perhaps observing Baxter in return. Despite seeing it for a longer period of time, it was late at night, and his best sighting was of the creature momentarily silhouetted against a field. A drawing made by Baxter similar to the one at the top of this page. The next night a young man, Will Taintor, was driving a friend of his home when she spotted the creature. The girl, Abby Brabham, described it as being down on all fours, hairless, and having glowing green eyes. The witness stuck to her guns even after it became known Bartlett had described the eyes as orange. Brabham's original sketch, which looks to me like a giant wiener dog. What explanation is there for such a creepy little monster, prowling the streets late at night? 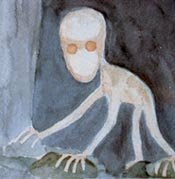 Generally speaking, the community of people interested in such things draw the conclusion that the Dover Demon was an alien stranded, for some reason, on earth temporarily. They even go so far as to identify monsters sighted in other parts of the world as "Dover Demons." The first example of this to come to mind is an incredibly fuzzy photo of a man on a horse from South America that shows a little critter vaguely similar to the Dover Demon crossing the road in the background. The aforementioned photo. 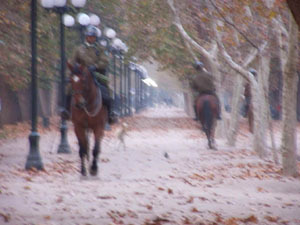 Notice tiny creature to right of left horseman. This image is to fuzzy to be of any real use; a prodigious leap of faith is required to assume it to be authentic. Importantly, there was no "UFO activity" in the area on the night in question. Had there been strange lights in the skies reported in and around Dover that night, the Dover Demon-as-alien argument might hold some water (to some extent) but that didn't happen. None of the things that UFO enthusiasts normally point to as "proof" of alien contact occurred in this case, with the exception of people seeing something really weird. This led tot he development of a second explanation that is slightly better: that the Dover Demon was not, in fact, a space alien, but was rather some manner of Fairy. 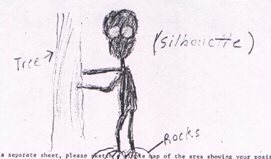 This explanation, though far from satisfactory, is better due to two things: First, the Dover Demon does not resemble anything else reported in UFO cases. It has some vague resemblance to the standard "gray alien," but being a quadruped with shining eyes certainly makes this resemblance no more than passing, at best. Some claim it resembles the Hopkinsville Goblins, but since they stood on two legs, had triangular heads, and wore clothing, I have a hard time seeing it. There is much less evidence for Fairies: people report them infrequently at best. There's certainly nowhere near as many descriptions of Fairies as there are of space aliens, so one could argue that the fact that it does not resemble previous fairy reports is not quite as substantial a problem with that theory. Also, when dealing with Fairies, one gets into an entirely different realm of though. Whereas the space aliens are generally considered to be biological entities from some distant planet, Fairies have more of a magical aspect to them and could, theoretically, change shape, have glowing eyes, so on and so forth. There's a lot more wiggle room when talking about the rather more magical world of fairies than the mundane world of space men. All of the witnesses to this creature have been reported as "credible" witnesses and none have ever altered their stories. However, Bill Bartlett had a teacher who warned investigators that "If I waas to pick someone to pull something like this, it would be Bartlett." That being said, investigators were on the scene fairly rapidly, so it's unlikely that the memories degraded or changed between the incident and the investigation. One problem with any supernatural explanation for this event is the glowing eyes. One witness swears they were orange; another, green; another, that they did not glow at all. The two that reported that the eyes were glowing, and thus more likely to be of other worldly origin, were in automobiles when their sighting occured. If you've ever had a pet that shined a flashlight on (I had cats as a child) you've seen the phenomenon called Eyeshine. This occurs when light from, say, a flashlight or the headlights of a car, enters the eye of an animal, reflects off of the back, and comes back out through the eye. With my cats, their eyes would glow and orangey-blue. A wide range of colors are possible through this effect, which perfectly explains the glowing eyes. They were just normal, biological animal eyes that were glowing because of the headlights of a car. Without the glowing eyes, what do we have? Some sort of animal is most likely. All of the original witnesses, though spooked by the things appearance, originally thought they'd just seem some sort of wierd animal. Some sort of wierd, but perfectly terrestrial animal. Some theorized that the creature was, in fact, a fox that had contracted a disease of some sort that caused severe swelling and bloating. Others have theorized that the creature was in fact a baby moose. Martin Kottmeyer went to great lengths explaining why he thought this, and Loren Coleman went to equally great lengths explaining why this wasn't true. My main problem with this theory was that it was reported to be standing on two legs by Baxter; however, it's not unreasonable to theorize that if it were indeed a moose, it was feeding from the upper parts of the tree, and that it was just leaning on it with its two front legs. 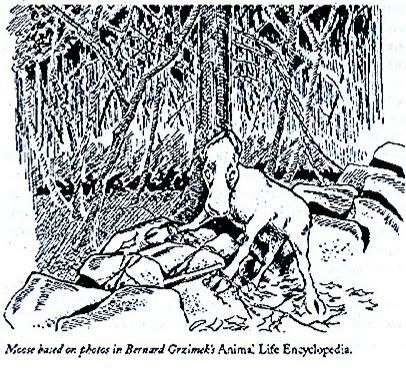 Image accompanying Kottmeyer's original article, Demon Moose, with original caption reading "Moose based on photos in Bernard Grzimek's Animal Life Encyclopedia." Who's right? Not only do I not know, I doubt that the issue will ever be properly settled. The event was too long ago, and the only way to know for sure would have been to set up a dragnet operation to sweep the area for bloated foxes, baby moose, or space aliens. Of course, had officials done this at the time, rather than just let the local newspapers sensationalize the hell out of it, and a mundane explanation been found, we would now be debating "The Government's Cover-Up of the Dover Demon " instead. Oi vey. Three teens in a rural area got quick glimpses of something late at night on a back road. The best witness saw the thing for maybe five seconds from a moving car. There was no UFO activity in the area, the thing did nothing supernatural than just stand there, and no other creature more than vaguley similar has ever been spotted elsewhere in the world. Ask yourself the following question: Which is more likely? That a bunch of teens saw some sort of animal, or that space aliens conquered the nontrivial challenge of interstellar travel and decided to take up the hobby of giving rural teenagers the jibblies?